All our streams are stocked with German Brown and Rainbow trout, introduced by British at the peak of the British Raj in India (early 19th century). You can catch fish everywhere from the lakes to rivers or back country creeks. Fly anglers also are notorious for the dozens of different knots they use, many of which correlate with the type of fly line, leader and tippet they rely on. You also need good walking shoes (no waders) & earth color clothes. Only artificial wet flies like Peacock, March Brown, Butcher, Jungle Quill, Coachman, Royal Coachman, Woodcock & Green, Teal & Green, Silver Doctor, Thunder and lightening, Invicta, Muddlers, and Watson’s Fancy are allowed. You can also use all sorts of dry flies and nymphs. There is a limit of 6 fish per angler daily. There is no catch and release in Kashmir. 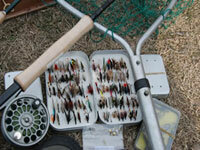 Fly fishing is a mystery to many, an addiction to the rest. I have been fishing since my childhood and learned this art from my late father. 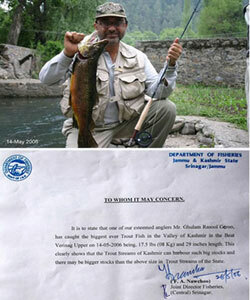 I am proud to mention that I am a Brown Trout record holder in Kashmir / Asia (certified by the Fisheries Department of Kashmir). 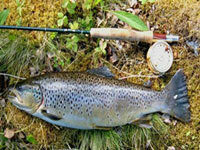 I caught a fantastic brown trout (17.5 lbs or 8 kgs, 29 inch long) in spring fed beat Verinag Upper on 14th of May 2006. If you don’t have your fishing gear, we can provide you everything including Rods, Reels, Lines, Tippets, Flies, Nets, Fishing Permits, Fishing Gillies, Fishing Guides, Food and excellent transport with experienced Drivers. 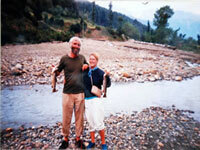 Further on request we can chalk out any special itinerary for trout fishing as you wish.